Sea cabbage, also known as stipeless kelp — the lack of stipe is clearly visible in these images: the blades attach directly to the small branched holdfast, even in the young example at bottom left. Photos by Jenn Burt (bottom left), Joel White (top left), and Sara Wickham (right). This brown algae is unique in having no stipe between the holdfast and blades, making it relatively easy to identify. The blades are somewhat thick, up to 1.5 m long and 80 cm wide (usually smaller), and may be smooth (as in photograph) or more wrinkled or puckered. The blades are fairly fragile, and tend to get torn up with age. Sea cabbage has a hapteroid (branched) holdfast (view photo of holdfast), and is a medium to dark chocolate brown colour. Sea cabbage grows on rock in mid to low intertidal areas of exposed and semi-exposed shorelines. It becomes a dominant algae in areas with moderate wave exposure. Its range extends from the Commander Islands in Russia east through the Aleutian Islands, and south along the west coast of North America to Monterey County in California. 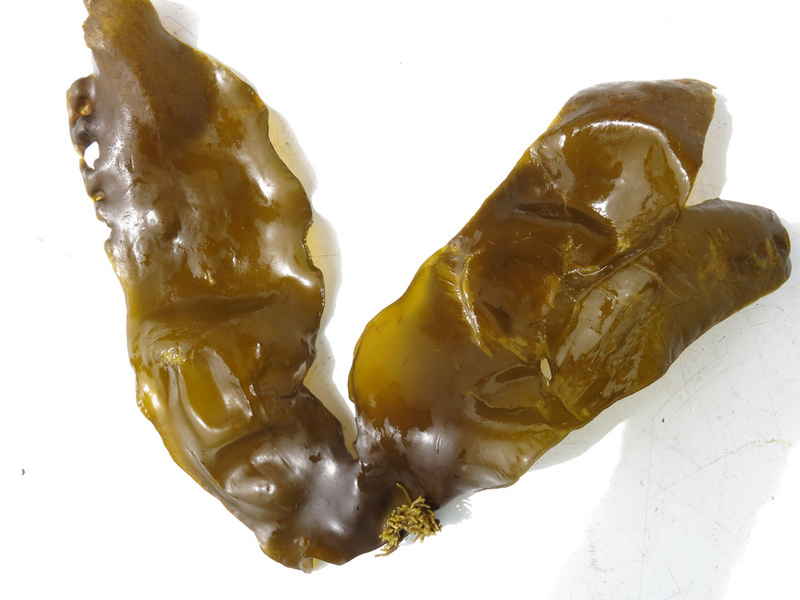 The torn blades of sea cabbage can sometimes resemble the blades of split kelp (Saccharina groenlandica); these blades are split longitudinally into two or three sections. 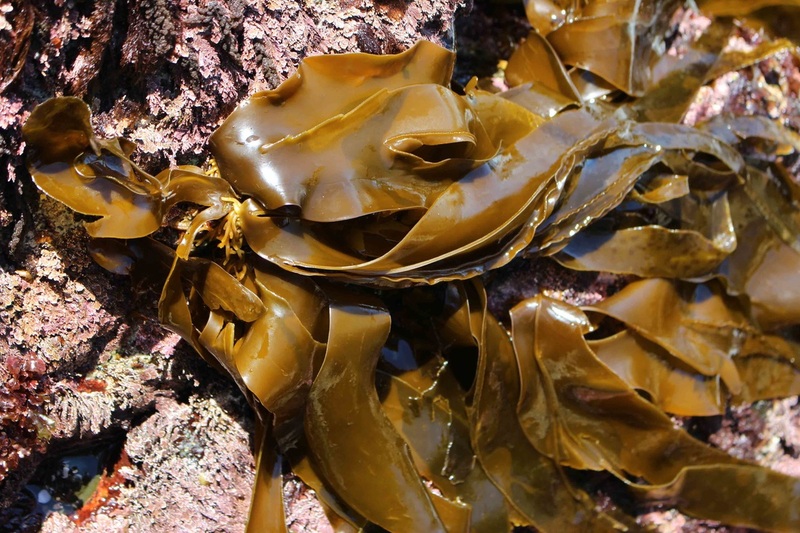 Split kelp has an obvious stipe, however, so should not be easily confused with sea cabbage. 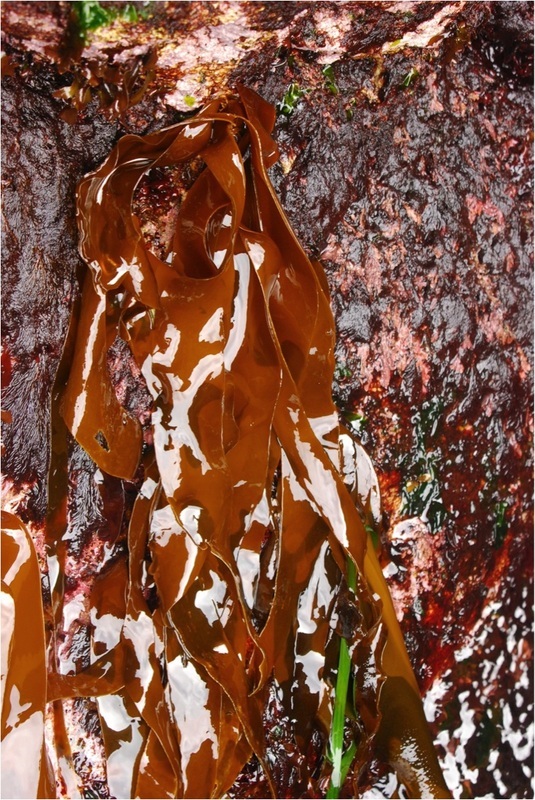 In British Columbia and Washington State black caty chitons (Katharina tunicata) feed on sea cabbage more than any other brown kelp; these chitons chew on the holdfasts of young mature kelp. Grazers that often cause extensive damage to kelp beds, such as sea urchins, don't eat sea cabbage. As a result sea cabbage forms large canopies in these areas. When urchins and other damaging grazers are not present sea cabbage is quickly out-competed for space by other large brown kelp species. Guiry, M.D. & Guiry, G.M. (2013). Saccharina sessilis (C.Agardh) Kuntze. AlgaeBase. National University of Ireland, Galway. Accessed 20/06/2013. Lindberg, M. and Lindstrom, S. (2010). Saccharina sessilis. Seaweeds of Alaska. Accessed 28/07/2014. O'Clair, R. and Lindstrom, S. Saccharina sessile (C. Agardh) Kuntze. In Klinkenberg, Brian. (Ed.). E-Flora BC: Electronic Atlas of the Plants of British Columbia. Lab for Advanced Spatial Analysis, Department of Geography, University of British Columbia, Vancouver. Accessed 28/07/2014.